This seems to be a hot topic for most of us — printing and organizing our family pictures. So, I asked Liz if she would share her “creative process” this week, just so we can get a glimpse of how someone else manages to keep up with this daunting task. 🙂 I think the key to get started is to NOT WORRY about all the catching up – just start now! It will be a lot easier to catch up on the last few years than it will be to catch up on 18 years because we never got started – right?? It appears that my last piece about my family photo albums struck a bit of a nerve. 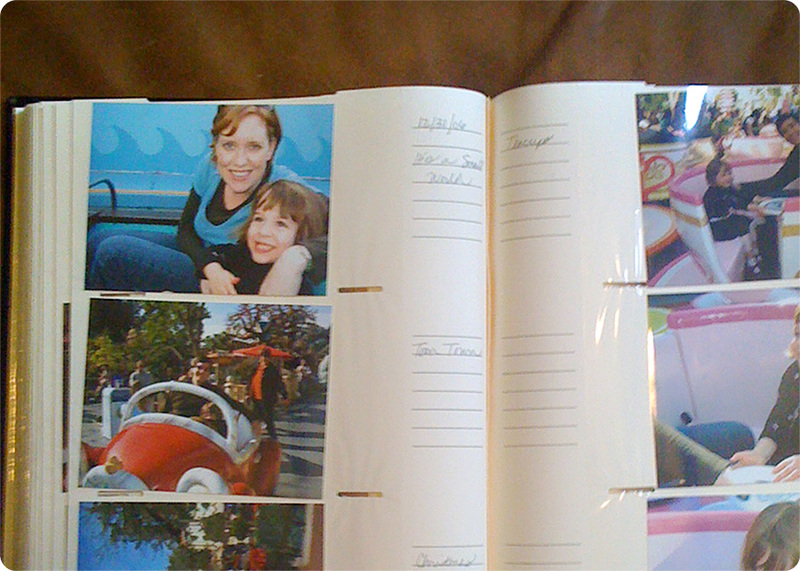 Many of you expressed guilt, regret, even longing regarding your own lack of photo albums. That was certainly unintentional, and let me assure you that the rest of my life is not nearly as organized! I do encourage you, though, to give your photos a chance. It doesn’t have to be daunting, and will definitely be rewarding. In case it helps, here is how I go about keeping on top of the picture clutter. 1. I don’t stockpile images on my camera. Primarily because neither my parents nor in-laws would allow it. After a major event, or even after I’ve snapped a particularly cute shot, I upload them to my computer. This naturally leads me to step 2. 3. Within a few days, my envelope of photos arrives in the mail. From here they will often spend up to a couple of weeks on top of my desk. But that bright green envelope is hard to ignore, so I usually get them slapped into the album in an effort to clean off my desk. It never takes more than 10-15 minutes, either. I keep up with events so that I usually only have to file one at a time. This is also an important time to edit: you don’t need six pictures of your child eating his or her birthday cake! 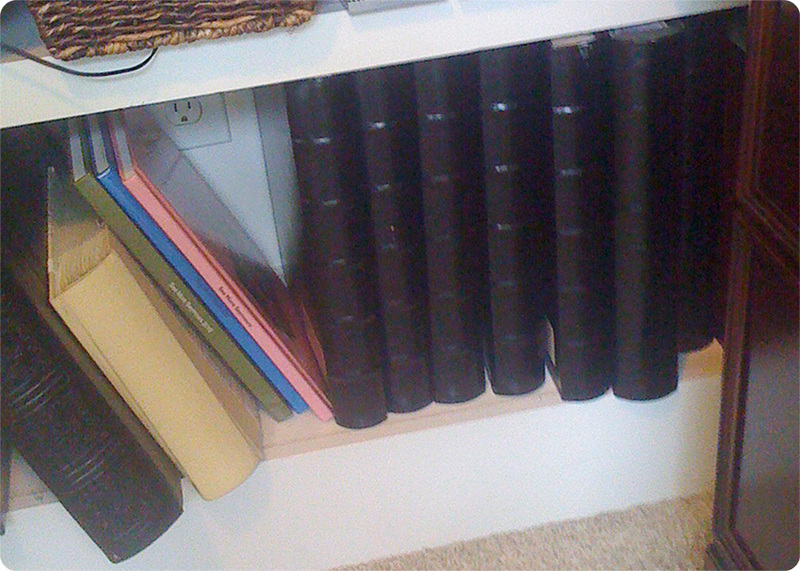 Your photo albums themselves can help you stay organized, too. Several years ago, I decided I wanted matching albums that would look sleek on my shelves. I found some nice black leather ones at Target that provide pockets to slide in the photos as well as lines to write a quick caption next to them. I purchased five at the time, and wish I had bought more. Fortunately, I recently found some at Costco that are very similar. If you’re still overwhelmed at the thought of starting albums after several years, I suggest working backwards chronologically. The most recent will be the quickest for you to organize, which will build your enthusiasm for the task and the confidence that you can eventually finish! Here are a couple quick snapshots of my albums – simple and clean.